This really appeals to me. If the new Komandirskies or Amphibias were available with such a tasteful white (or whitish) dial, I believe I would snap one up. My first Komandirskie arrived today from Chistopol. I love it. stovey and slowcoach like this. I have only old dirskies! here is some of my favorite old ones! Byron2701, admiralStojakovic, Stone Hill and 5 others like this. 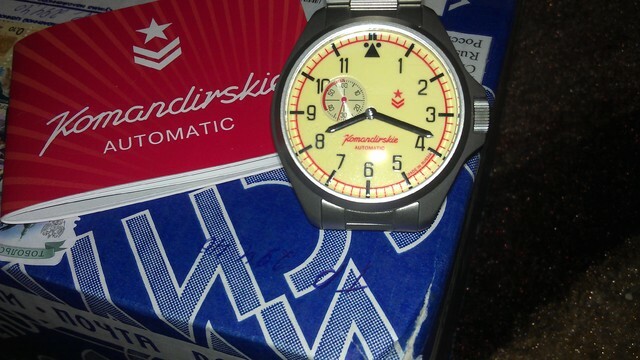 Received a zakaz paratrooper today with an olympic-themed bracelet. Last edited by GenkiSushi; February 10th, 2013 at 01:16.
admiralStojakovic, stovey, OhDark30 and 3 others like this. Last edited by imran1979; February 11th, 2013 at 21:02.
stovey, slowcoach, chriscentro and 4 others like this. My addition given to me by a coworker that was in the Russian military. Today's problems are tomorrows jokes. slowcoach, Reno, stovey and 1 others like this. slowcoach, Reno, hafeedz and 2 others like this. Reno, stovey, jose-CostaRica and 3 others like this.